Kara Goucher has become one of America's most recognizable runners, and for good reason, with accomplishments such as a third place finish in the 10,000m at the 2007 World Championships and a recent 5th place finish at the 2011 Boston Marathon. While not every great athlete makes a great coach (and not every great coach was a great athlete), it's unlikely that someone like Goucher would be able to get as far as she did without picking up some knowledge along the way. 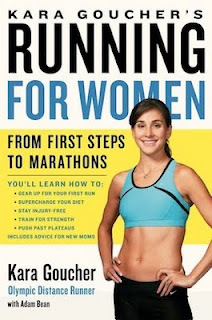 In Kara Goucher's Running for Women: From First Steps to Marathons, Goucher passes some of that knowledge along to the reader, giving a lot of information that I can honestly look at and say "I wish someone told me that when I started running!" If I found out that one of my nonrunner friends was going to start running, I would buy her this book. I'd probably buy it for one of my guy friends too, and conveniently black out the "women" part of the title with a Sharpie and just tell him to ignore the chapter on pregnancy. There are a lot of things that I've learned in 12 years of running that I didn't know when I started, things that would have made my life easier had I learned them through some way other than trial and error. Much of it can be found in various training books or on the internet, but most beginners would be completely overwhelmed by the 900+ pages of physiology and kinesiology in Lore of Running, or don't know where to even begin looking online. In her Kara Goucher's Running for Women, Goucher collects a lot of this information and writes it all down in one place, in one easy to read book that is very accessible for the beginning runner. While some of Goucher's advice is the same basic information that seems to get posted in every article in Runner's World and Active.com, there are also some gems that I'm glad she included, because I don't believe that they're common knowledge among runners, and I do believe can be helpful for many people. 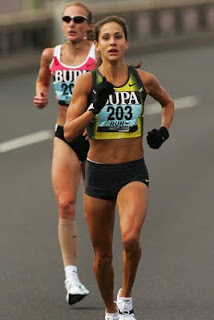 For example, she states that the long run should make up no more than 20% of one's weekly mileage, touches on the concept of working in some barefoot drills and having a pair of fast shoes specifically for racing, but emphasizes that most running should be done in trainers, talks about how deviations from a training schedule are normal and expected, and even mentions that no one really sleeps the night before a race, so to focus on sleeping the nights preceding that. I would have loved to have known some of this stuff earlier in my career! I figured out the 20% rule on my own, but not until I actually sat down with my coach's schedules and did the math and poured over plenty of George Malley's writings on LetsRun. The shoes thing is the same conclusion I reached after extensive research, but that was a lot more work on my part than just reading this book and taking Goucher's word for it. The training schedule deviations are common sense, but runners get so obsessive compulsive about following their schedules, and it's refreshing to hear an elite runner say that deviations are normal. I didn't even hear about critical night until my fifth year of running. And that's just the beginning! I was also really happy that Goucher devoted a few pages to stating that the marathon may not be an ideal early goal for beginners, and that it's not the be-all end-all race (a mentality that seems really prevalent among many beginning runners). Goucher herself was running competitively for 18 years before she attempted her first marathon (more patient than me...I waited 10). Goucher does not really elaborate on any of the information she offers. Each piece of advice is offered as a short tidbit based on Goucher's experience, without the accompanying science or sources backing up what she has to say. This can be seen as a good or a bad thing, since it further helps the book to be accessible and easy to read, but may leave the student of the sport wishing for more information. Daniels this is not. The advice is sound, but I would have liked to see a little more about some of the topics. Additionally, if you've been running for a few years, have read some of the more scientific books, and keep up with a few running websites, there probably won't be anything in this book that you haven't seen before. In addition to her insights on training, Goucher also includes short narratives illustrating her own career, each story pertinent to whatever subject she is about to tackle. These stories are a nice touch, as they provide diversion for the beginner who does not want to be overwhelmed, and add interest for the veteran who has seen all the running advice already. Goucher also brings in other people with different knowledge bases to offer their input, including her coach and former elite runner Alberto Salazar, her ART therapist Justin Whittaker, and others. Where I feel that this book falls short are in the training plans included at the end of the racing and marathon chapters. Looking at this book's intended audience, I wasn't expecting Goucher to include her own schedule in this book. However, I would have liked to see her draw upon her own experience a little more, because I can't imagine that even when running lower mileage in high school, she ever did anything even remotely resembling the plans laid out in her book. Each plan involves running three days per week (which is reasonable enough for beginners), but then has a speedworkout that doesn't quite look like it fits in, and the marathon plan has a long run that is kind of on the ridiculous side. Every speedworkout in the 5K and 10K plan is repeat 400s, and every speedworkout in the half-marathon and marathon plan is repeat 800s, with no direction as to pacing and no real variation in workouts. Additionally, while it's impossible to follow the 20% rule that she mentioned earlier in the book when only running three days per week, the marathon plan includes a long run of 20 in a week of 33 miles (61% of the total volume for the week)! It's probably not in Goucher's best interest to actually discourage people who don't have time to run more than three times per week from running a marathon, but based on what she had said earlier in the book, I have to wonder what she was truly thinking when she was writing those plans. I would have preferred to see her either follow the principles she has learned through her own training and write a "dummied down" schedule based on that (a la Pfitz, who I'm sure didn't train with the schedules he laid out in his books, yet he still applied his knowledge the best he could), or to see her include a sample from her own log and allow her readers to learn from that (a la Sage Canaday, who included teammate Drew Polley's log in his book). Kara Goucher's Running for Women is perfect for the beginning runner, female or male. It's accessible, it's unintimidating, it's easy to read, it doesn't delve into details that will overwhelm the beginner, and it offers some good advice. It will have less to offer for the advanced runner and for the student of the sport, though both may find the narratives that open each chapter interesting and entertaining. I do believe that Goucher missed the mark with her training plans, and more information about the "why" behind the advice would have been nice, and as the runner gets more experienced, she may be happier with one of the other books that I've written about here. However, it's a great book for the beginner, as well as for the diehard Kara Goucher fan who's heard all the tips but is dying to read her personal stories. It also doesn't hurt that Goucher's name is attached to it, given that she is recognized as one of America's top runners and because she has become a role model for countless female runners (and probably some male runners too). Just don't go into it expecting Daniels or Noakes, and you'll be fine. Kara Goucher's Running for Women: From First Steps to Marathons retails for $16.99, and can be found on Amazon. Full disclosure: Nothing to disclose. I borrowed this book from the library and have no affiliation with Kara Goucher, the Nike Oregon Project, or Nike.